Editor’s Note: We want to deeply thank Chittick Family Eye Care for its sponsorship of this week’s Great Glasses Play Day event. We couldn’t have brought this event to Central Illinois without its support. Chittick Family Eye Care welcomes new patients of all ages and offer exams for infants as young as 6 months as well as kindergarten exams. Their services range from spectacles for general use, to specialty lenses for sports, hobbies, or occupational use. Not sure about your vision coverage? They accept EyeMed, VSP, Health Alliance and many more of our area’s most common insurance plans. Chittick Family Eye Care has five area locations: Savoy, Rantoul, Villa Grove, Danville and Hoopeston. It was around Thanksgiving that we realized that our daughter’s eyes were crossing. At first, we thought she was just messing around with her vision. Focusing, then unfocusing. It especially happened in the evenings when we were at the family dinner table. After three weeks it was clear that this wasn’t a phase. One week, I thought (perhaps hoped) that it had gone away. But another week, my older kids couldn’t stop talking about their sister was grossing them out. They asked her to “stop” it. Not that there was a thing she could do about it. A call to the pediatrician later, we had an appointment with an ophthalmologist – after a difficult seven-week wait. Uncertainty is a terrible curse. For worriers like me, it leads to thoughts of the worst. possible. outcome. Perspective told me that this wasn’t life threatening, but merely another one of those things we parents have to digest. Still, I couldn’t stop googling, seeing words such as “eye” and “SURGERY” jumping off the page. Once we finally saw a doctor, we learned that our daughter has a form of strabismus. This is a condition in which both eyes do not look at the same place at the same time. It occurs when an eye turns in, out, up or down and is usually caused by poor eye muscle control or a high amount of farsightedness. If left untreated, it can lead to permanent vision loss. Her doctor is confident her condition will be treated by glasses, and we won’t be facing surgery. But there is no cure, and she has to be watched continuously. We will be spending a bit of time going back and forth to Peoria to see the pediatric ophthalmologist, at least four times a year. Just before she turned 2 years old, little Neena received her first prescription for glasses. 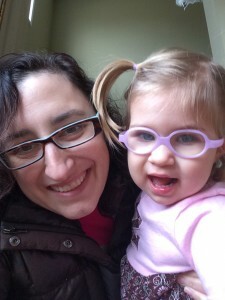 After doing some research (highly recommend the website littlefoureyes.com), we discovered that Chittick Family Eye Care was the only optical center in our area that carries the type of frames most recommended for children 4 and under. Beyond the product we wanted, we discovered something we didn’t expect. It was only after going to Chittick and meeting their wonderful staff that we truly felt at ease with our daughter’s diagnosis. It sounds cliche, but the Chittick staff didn’t just take care of our daughter – they took care of our whole family. They answered all of my (seemingly endless) questions. They helped us to figure out where and how to approach a second opinion. And when we had a few bumps in the road, they were nothing but accommodating. This experience opened our eyes – pun intended – to the needs of children with vision issues. And it’s why we are passionate about bringing the Great Glasses Play Day to the Champaign-Urbana metro as we celebrate our children in glasses, or contacts or patches. The Great Glasses Play Day is a day to show how proud we are of our children in glasses, how thankful we are for better vision for our kids, but most of all, it’s an opportunity for kids to have fun — and see others who “look like” them. My best friend of a zillion years was right. There is nothing cuter than a young child wearing glasses. And I can’t wait to see a whole lot of them on Saturday. Laura Weisskopf Bleill is the Mom-in-Chief of chambanamoms.com. She welcomes your comments here, or you can contact her via email at laura@chambanamoms.com. She wears glasses, too.